Our destination today is the southern craters of the highest volcano in Europe and the nice fishing villages of Acicastello, Acitrezza and Acireale on the Ionian coast. 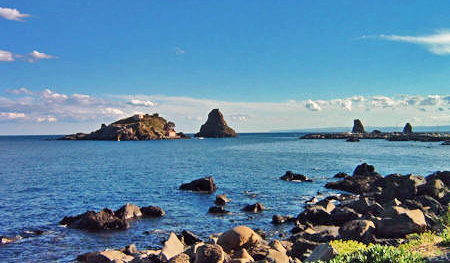 Aci Castello boasts a rich production of citrus fruits, olives, grapes, almonds, and cereals. Cattle breeding is flourishing because of the numerous pasture areas. The outstanding handicraft work includes wooden objects. The name Aci Castello derives from the homonymous Castle situated on a nearby hill of lava rock, built by the Normans in 1076. The origin of Acitrezza, currently fraction of Acicastello, goes back iwhen in the 1672 Stefano of the Riggio prince of the house of Campo Fiorito acquired the territory. In 1600 in fact, it was a zone nearly completely deserted where the inhabitants of the ancient Acireale worked linen and hemp to interlace them. Perhaps from this fact derives the name "Trezza”, even if moltiple are the hypotheses on the origin of its name. Today all know Acitrezza, not only for the beauty of its landscapes, but also because the catanese writer Giovanni Verga has made it protagonist of its novel, "the Malavoglia”, describing the life of the fishermen and their families. The name Aci derives from the Greek term Akus, that means penetrating and refers to the coldness of the homonymous river, subsequently covered by the lava flow. During the Roman period, the suburb was called Aquilia. Destroyed by 1169's earthquake, it was rebuilt and attributed the name of Aquilia Nuova. In 1326, because of an incursion by will of King Roberto of Napoli, and the subsequent disastrous fire, the inhabitants found shelter on a nearby hill, where they founded the current inhabited center. 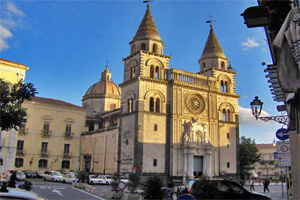 In 1642, the town was baptized as the "Citta' Regia" (royal city) by King Filippo IV, thus the derivation of today's name Acireale. Mount Etna is one of the most active volcanos in the world and the highest and largest in Europe. It is in fact 11.000 ft and covers an area of 606 sq mi. It is the result of very ancient submarine eruptions in the gulf, which started in the Quaternary period, about 500.000 years ago, following movement between the tectonic plates: this released magma up to the ocean floor into the area now occupied by Acicastello and caused surges of lava and vapour which settled in the vicinity of modern day-Paternò.